TechRadar is hurtling through space at six hundred miles per hour. It's difficult to take our eyes off course, but as we glide below a mothership we have to look up and admire the scale of the behemoth above us. It snatches the breath. Right now there's very little to shatter the illusion that this is actually happening. But far from the distant reaches of space, we're sat in a studio in Guildford, UK, with what looks like a pair of early production model ski goggles strapped to our face. Unless you've been living inside your own virtual reality for the last year, you've probably become aware of Oculus Rift. The low-latency VR headset, capable of transporting us to 3D virtual worlds, has been gathering momentum and will soon be unleashed on the consumer market. But right now it's in the hands of developers to make these experiences possible. 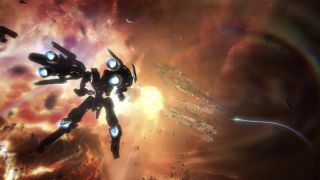 Among those taking the charge is Born Ready Games, creators of Strike Suit Zero - a space combat game in which you assume the role of an intergalactic fighter pilot. The game was born from a Kickstarter campaign and released to PC earlier this year, and since then Born Ready has been beavering away on Oculus Rift support for the title. So why did the team decide to jump on the VR wagon? Once you've taken a ride on Oculus, the answer seems simple: virtual reality and space were made for each other. Whether it roots from Spielbergian sci-fi or just a sheer curiosity of the unknown, the desire to explore the far reaches of space continues to be an enduring one for so many people. "We've been brought up on Star Wars and Star Trek and Battlestar," says Born Ready Games CEO James Brooksby. "It's in all our fantasies, to be out there and be a space fighter pilot. "What people want to do with virtual reality is have a virtual reality. Something they can't ordinarily do. In an airplane you can have some of that because most of us don't get to fly airplanes. But in space you're in a fantasy environment, you've got something that grounds you in reality but you've got the fantastical around you." Space could be the key that ignites Oculus's engine. "Immediately everyone goes: 'That's got to be one of the perfect things for virtual reality'," says Brooksby. But Rift could be just as important to the rebirth of the space simulator. "Before we became Born Ready Games, there was nobody working on space combat at all," he says. The days of Spasim and Elite may be a twinkle in the past but the quality space-based titles since have been far and few between. The space simulator genre took a decline towards the end of the 1990s - a trend that's now starting to see a reverse thanks to titles such as Strike Suit Zero and mass multiplayer online title EVE Online. EVE has also been toying with Oculus Rift support. In fact, the game's developer and publisher CCP was even a Kickstarter supporter of the VR headset. The Oculus support was then demoed to players at EVE Fanfest in April. "It was a huge hit," says CCP's Chief Marketing Officer David Reid, who admits he was a little skeptical until he finally went eyes-on with the headset. He describes his first few moments in game: "This guy goes by so I think I need to catch up so I take this really hard turn and I suddenly feel my stomach drop out like you're on a roller coaster or on a plane. And I'm like 'Ok, this is more intense than I expected'".